Okay everyone, I just threw that price up there to start things a-smokin. That is, on Craigslist not to you guys. My experience has been that a couple of bikes I have previously listed there ended up selling for 500-700 less than my initial "smokin" price (I'm waiting for the obvious joke here, let's see who lays it on me). However, if someone from this owners group were to show up at the ranch with $3500 cash, I would probably let it go for that, at least knowing it will be cherished and celebrated by a true believer..
You will need your reading glasses if you want to find cosmetic flaws in the finish, even on the engine. Hope that answers the question of how purdy it is. man that is a really nice looking bike. I've dropped the price to $2900. I know we had a couple of weeks of crummy weather and everyone's tapped out for the holidays, blah blah, so I'm sure that's why this beautiful FJ hasn't sold yet. I've already accepted that there will be substantial financial loss for me. 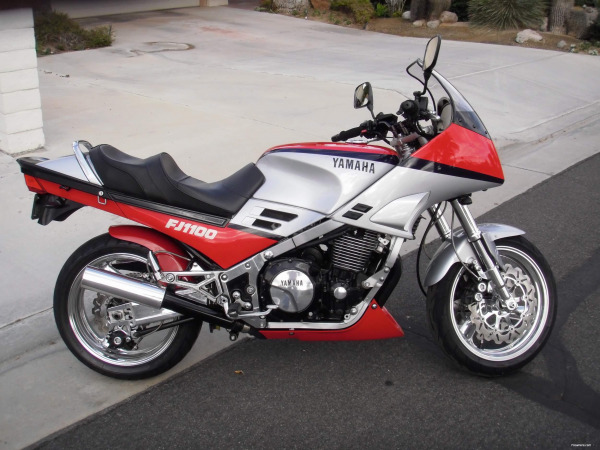 To see pics and details, check out my post from last month "1985 FJ1100 For Sale". Jack, I merged your posts into this single topic. No need to start duplicate topics for the same bike. Thank you for the help and encouragement Pat. I am hoping a member here picks it up. Some guy came around lowballing me and looking to flip it, I flipped him da hell outa here. I am good with neurophysiology but not so good at computer posting forum stuff. Has the second gear issue, an issue with the early models, been addressed? I wasn't aware of this issue, but with 32K miles on it with only one previous owner, I expect that it was never an issue with this bike or it has since been taken care of long ago. in addition, after purchasing it I had this bike gone over with a fine-toothed comb by a highly experienced motorcycle mechanic whom with I have entrusted my bikes for the last 15 years. It's a great bike and you can talk to the mechanic yourself (Roy's Cycle Service in Newhall), and I'll even put you in touch with the original owner. Jack, I split out our 2nd gear discussion from your For Sale topic.